Oh my goodness gracious alive. 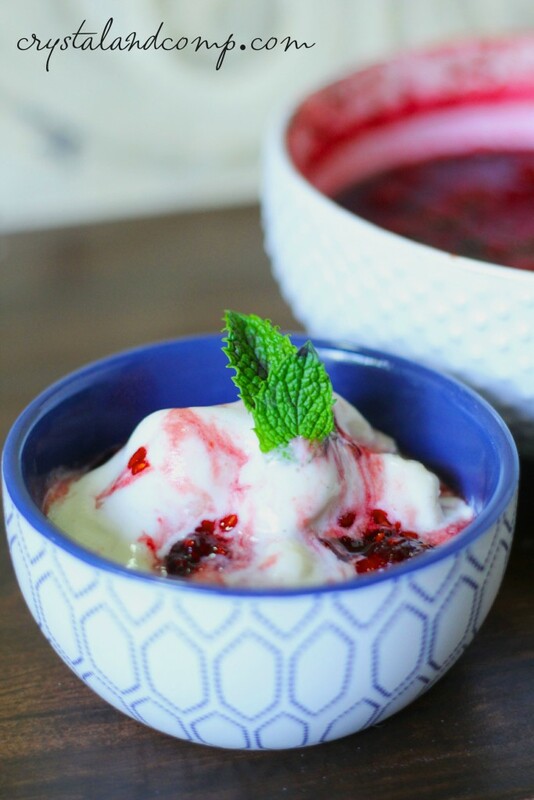 I am so excited to share this homemade, sweet and tangy ice cream sauce with you. It is out of this world! 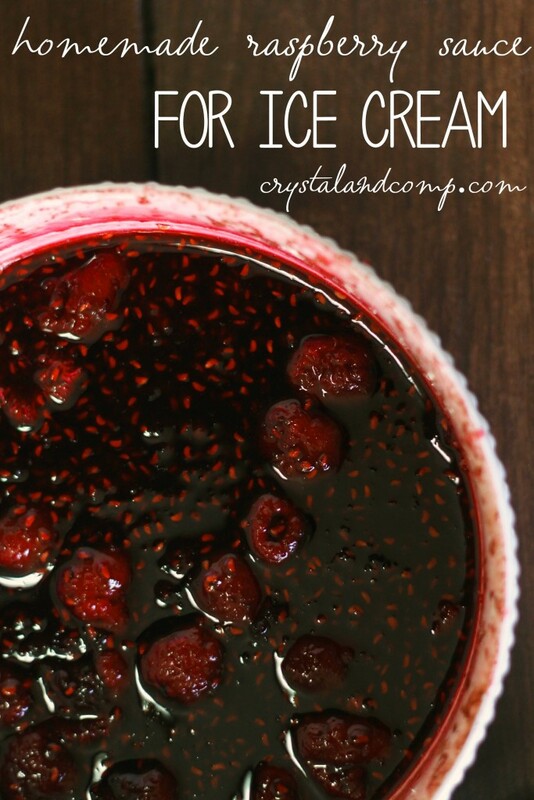 You make it using frozen raspberries and just a few other ingredients. You actually make it in the microwave. In a 2 quart, microwave safe bowl, add 2 cups of the frozen raspberries, the sugar and the lemon oil drops. Pop it in the microwave, on high, for 8 minutes. Stop and stir halfway through and then add it back into the microwave for the remaining time. 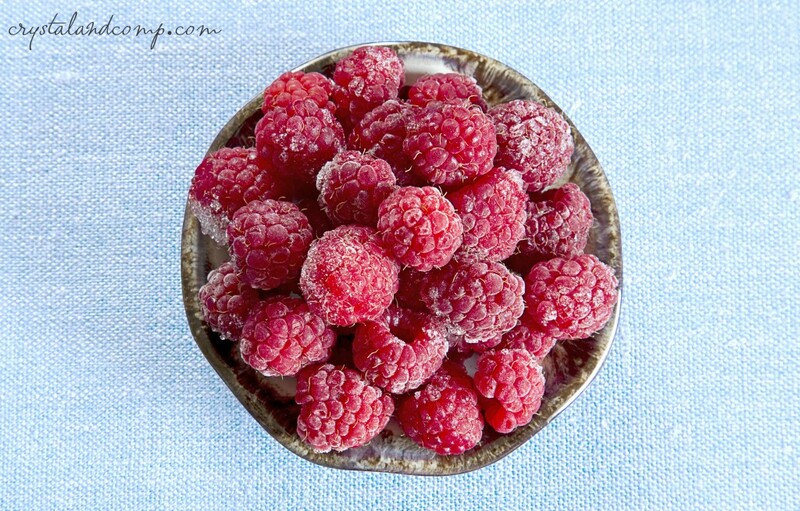 Once done, carefully remove from the microwave and add the remaining 1 cup of frozen raspberries. Stir to combine well and let it cool. Once it cools, you’re ready for the ice cream! Look at how amazing this looks! What a delicious combination for your next summer gathering! 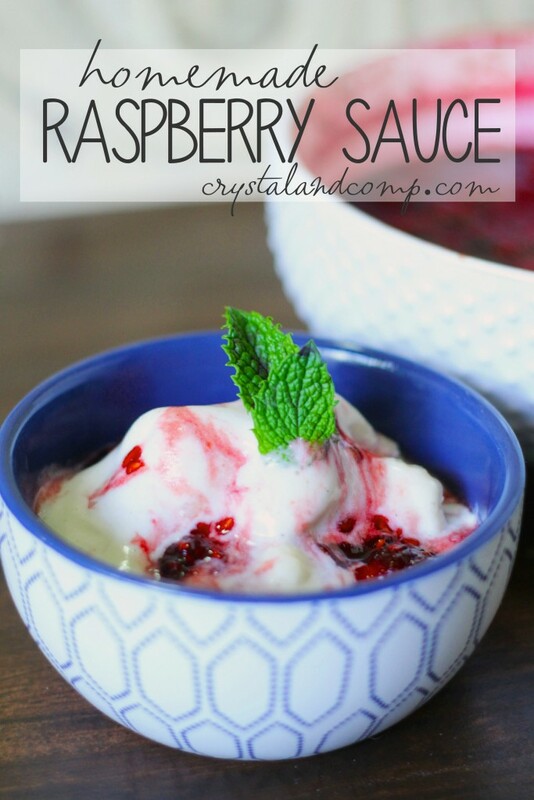 You will absolutely adore this simple raspberry sauce. 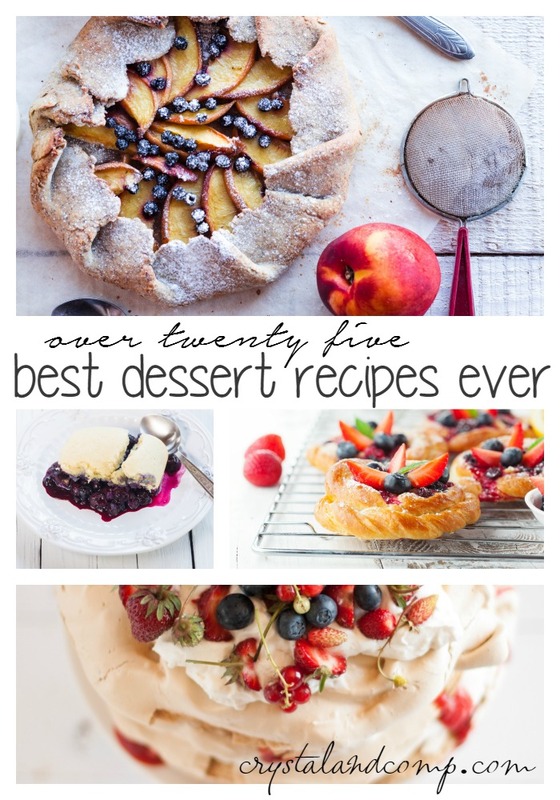 Check out our best dessert recipes your family will love! My favorite ice cream topping is probably peanuts or drizzled caramel. It isn’t so much a topping, put I love a warm brownie in the bottom of the bowl with the ice cream put on top. I suppose in this scenario that ice cream is the topping. My favorite topping is good old fashioned chocolate syrup. I LOVE to add a little bit of peppermint extract for a twist though. It’s sooo good! My favorite topping for ice cream is just a little chocolate syrup! Hot fudge is my fave! My favorite topping is hot fudge. My favorite ice cream topping is whipped cream. I love Hot Fudge with nuts. I like hot fudge and whipped cream on top of ice cream. My favorite is hot fudge, thanks! I like whipped cream on top of my ice cream. I like hot fudge on my ice cream! I love having a small amount of caramel on my ice cream as a topping. It’s very sweet so a little bit goes a long way for me. My favorite topping is Hot Fudge – Yum! My favorite ice cream topping is fresh strawberries and whipped cream. Yum! Hot fudge! And now this post has my mouth watering 🙂 Thanks for the opportunity! My favorite ice cream topping is caramel sauce. My favorite Ice Cream topping is Hot Fudge. My favorite ice cream topping would be hot fudge and whipped cream. I love caramel and sprinkles!! My favorite ice cream topping is chocolate syrup. Hot fudge is my favorite topping…but that Raspberry Sauce looks delicious! Hot fudge is my favorite ice cream topping! my favorite ice cream topping is candied walnuts or pecans! My favorite ice cream topping is caramel. It really depends on the ice cream I am eating. But melted peanut butter, caramel, or butterscotch are my favorite toppings. Although, I really like the health crunch coat too. It hardens on the ice cream! Hot fudge sauce and whipped cream. My favorite ice cream topping is another scoop of ice cream 🙂 Okay, I like Hershey’s syrup, too. I’m a huge fan of hot fudge! I love peanut butter flavored topping! I love hot fudge the most! I could put hot fudge on anything & love it. But I also love melty caramel drizzled on my ice cream, too! I love hot fudge and crushed nuts on my ice cream! My favorite topping is nuts on ice cream. I love peanut butter on my ice cream! Yum! My favorite ice cream topping is chocolate syrup! Crushed nuts and chocolate syrup. I like good ol’ chocolate syrup. I love fudge or any fruit topping! Generally not together – even though I’m sure they would taste great together. I just am either craving chocolate or fruit! 🙂 Thanks for the giveaway! My favorite ice cream topping is caramel sauce, and lots of it. Thanks. My favorite ice cream topping is chocolate coconut fudge …I cannot remember the specific brand. I love Marachino cherries and nuts too. my fav ice cream topping is peanut butter. I like caramel sauce on vanilla ice cream. My favorite ice cream topping is Hot Fudge and the type that pours on and hardens. Canned blueberries put up by a friend that are normally used as blueberry pie filling. My favorite is crushed oreos and snickers! I like caramel and cashews on vanilla ice cream. I like the brown sugar instead of the white. I need to try this! Thanks for sharing on the What’s for Dinner Link up! Mmm! this sounds quite refreshing for a hot summer day. Thanks for sharing on Creative K Kids Tasty Tuesdays. Oh, yum! This looks delicious and is so simple. I would love to put it over brownies and vanilla ice cream. Thank you for linking up to Family Joy Blog Link-up Party. Have a great week! Oh this looks so yummy and simple to make! Thanks for sharing with us at Totally Terrific Tuesday party, pinned it to our board! That is a lovely sauce. I like the touch of lemon! Thanks for bringing these to Throwback Thursday! Looks so good! Thanks for sharing at the #InspirationSpotlight party. Pinned & shared.